PushBlack.us is the first mobile-based organizing group for Black Americans. They offer daily Black History messages to educate and inspire the masses. This is their quiz. Click here and take the quiz! The following teams have been accepted into the Spring 2018 Co-op Academy! IN THE NEWS features the headline stories in other publications! We are working to compile all the news featuring each our cooperatives and showcase the expanding co-op community worldwide! OUR CO-OPS will feature each co-op on their own page. You can view their services, members, upcoming events and promotions and press. We are currently at 16 co-ops but we expect to grow every cycle as more cooperatives are incorporated and open for business! In partnership with the NYC Council and the Office of the Mayor, New York City agencies are working to build a more vibrant and inclusive city. The NYC Department of Small Business Services (SBS) contributes to this vision by connecting New Yorkers to good jobs, creating stronger businesses, and building thriving neighborhoods across the five boroughs. Worker cooperatives - businesses owned and operated by the workers - provide meaningful employment and help improve the City’s economy. They allow New Yorkers to build businesses together, therefore allowing all the workers to gain access to upward mobility and better working conditions. The NYC Council funded WCBDI in FY2018 to help create and support more worker cooperatives. 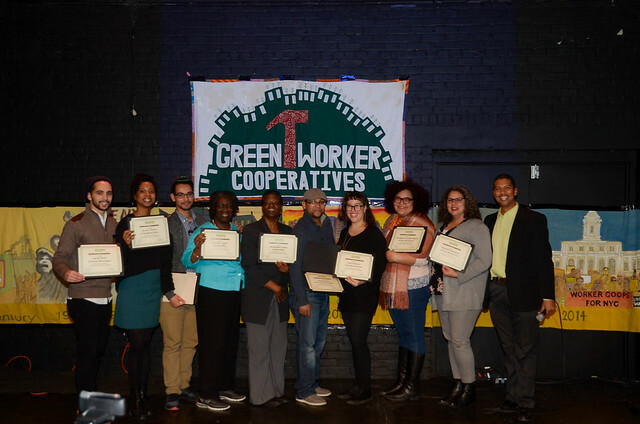 This funding supports 13 partner organizations, including Green Worker Cooperatives, and provides centralized program management through SBS. Our co-ops are featured in the report: Woke Foods in page 11 and New Deal Construction on page 19! Click to read the full report! Become a Sustainer and be part of the movement that is working to lift communities out of poverty, build an empowered workforce, and expand the cooperative community!